Mayor Lou Tullio boarding a new EMTA bus, one of a fleet of fifty. Mayor Lou Tullio boarding an EMTA bus. Louis J. Tullio had a long and illustrious career as the Mayor of Erie, Pennsylvania. He served from 1966 to 1989. He is shown here helping EMTA promote its new Fleet of 50 new buses. I wonder where this Express was going to drop the mayor off. Tullio was a teacher and a football coach before he was elected to public office. He remains are recognizable figure years after his death, which occurred in 1990. 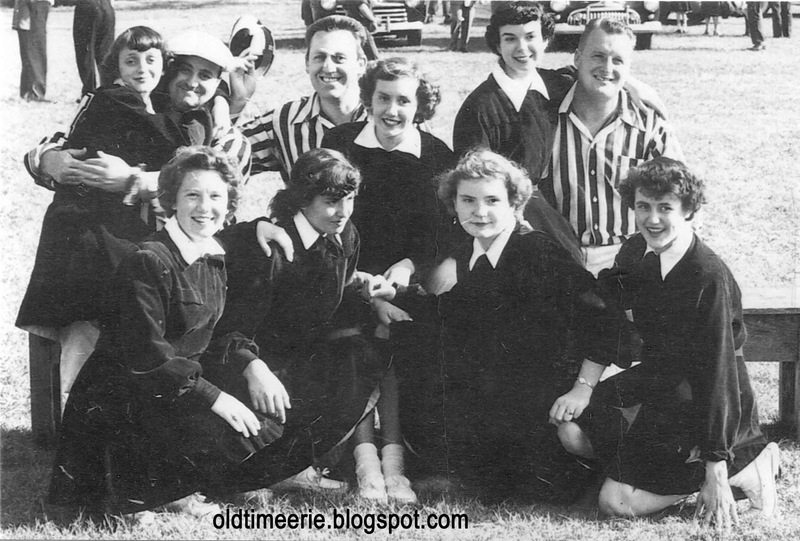 Below is a rare shot of football referee Lou Tullio with the Wesleyville High School cheerleaders around 1951. Old Time Erie- Lou Tullio on upper right. 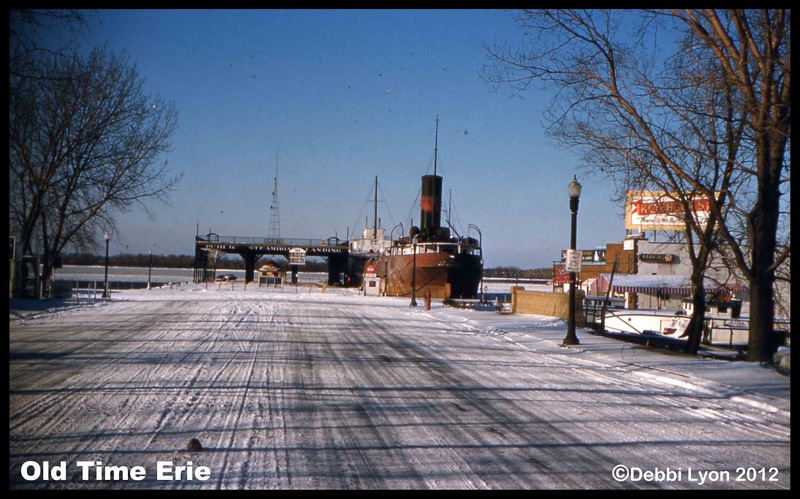 Erie Steamboat Landing in 1960. Photo by Chet Wasielewski. ©Debbi Lyon 2012. 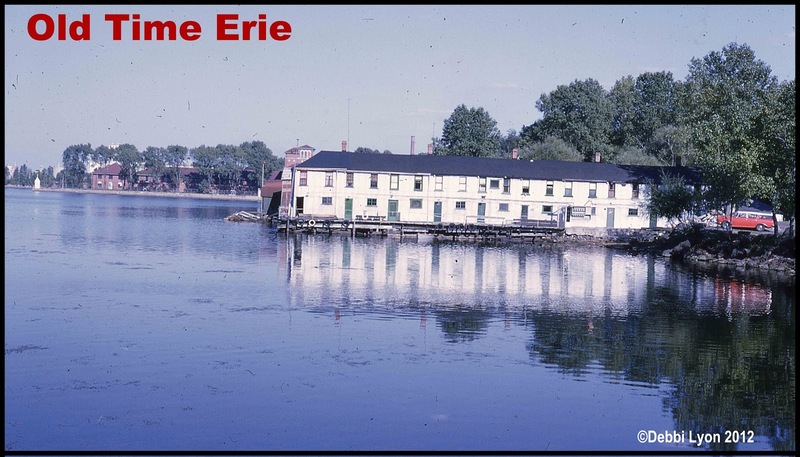 Here's a shot of the Public Dock on State Street in Erie, PA taken 1960, when it was still called the Public Steamboat Landing. There is a Koehler's billboard on the top of the building on the right, and an ore carrier in its winter berth. The dock is blocked off with yellow barriers so cars could not drive onto the dock when there was too much snow or ice. This photo was taken a little bit north of East Front Street. This area was under construction (in the spring of 2012) so that the bridge which takes State Street over the bay could be replaced. 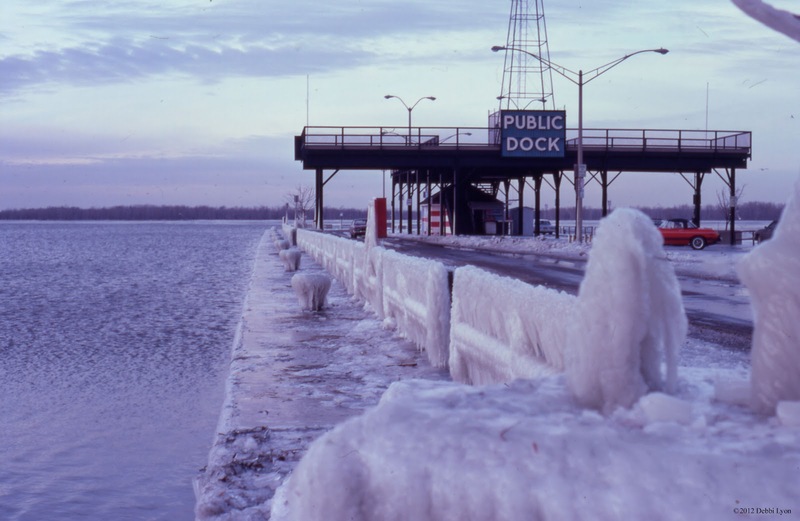 The Dock has always been a hot tourist attraction for locals and visitors to Erie, Pennsylvania. The new Koehler electric sign on the east side of the public dock was installed in July of 1952. The Public Steamboat Landing is now known as Dobbins Landing. The Bicentennial Tower is part of the Dobbins Landing complex. Erie has Pennsylvania's sole port on Lake Erie. Photo by Chester Wasielewski taken in 1985. ©Debbi Lyon 2012. Just think of the brutal wind whipping in from the north, spraying water from the bay onto the old Public Dock. The dock is a perfect place to take in the setting sun, catch a fish or capture a photo ducks or seagulls. Or, you can go here a shoot the breeze or get an ice cream cone. This tourist attraction has been renamed several times over the years and is now known as Dobbins Landing. The Bicentennial Tower replaced the old structure shown here. -General Telephone 1959 phone book. As phones became more prevalent in Erie County, PA, the telephone company started to run out of five digit numbers. So, they introduced the new, seven digit system. To make it slightly easier to memorize, each region had a two-letter prefix, followed by five numbers. For example, if you worked at First National Bank, you would tell your friends to call you at GL6-2011. There were a lot of unhappy people when the new exchanges were introduced, but people got used to dialing the extra numbers after awhile. Do you remember your old phone number? WJET-AM 1400 Top 40 survey from Jan. 29, 1975, "Lady" by Styx, and survey from July 28, 1977. I had a lot of favorites. Just ask my sister. My favorites became her favorites, like it or not. I was older than her. So she learned to love "The Night Chicago Died" and "Hooked on a Feeling," (the ooga-chaka version). You get the picture. 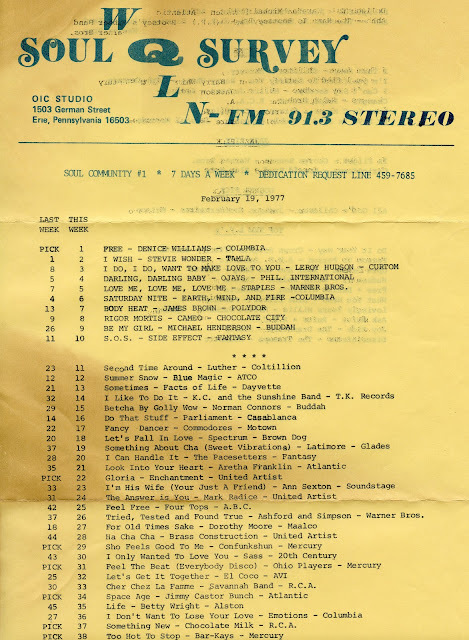 So, my favorites from the Jan. 29, 1975 survey include "Don't Call Us" by Sugarloaf, "Chevy Van" by Sammy Johns and "Bungle in the Jungle" by Jethro Tull. Moving forward, to the survey on the right from July 28, 1977, another of my all-time favorite songs; "Strawberry Letter 23" by the Brothers Johnson. "How Much Love," "Barracuda," "Handy Man," "Don't Stop," "Christine Sixteen," "High School Dance," "Jet Airliner," "Boogie Nights." The absolute best thing about this era? We moved to 22nd and Ash, which means I was just a few blocks away from 1635 Ash Street...the home of WJET!!!! OMG!!!! I don't know how many times I walked by that station trying to get a glimpse of the D.J. And I would actually go inside the studio once a week to get the new survey. And then high-tail it out of there. 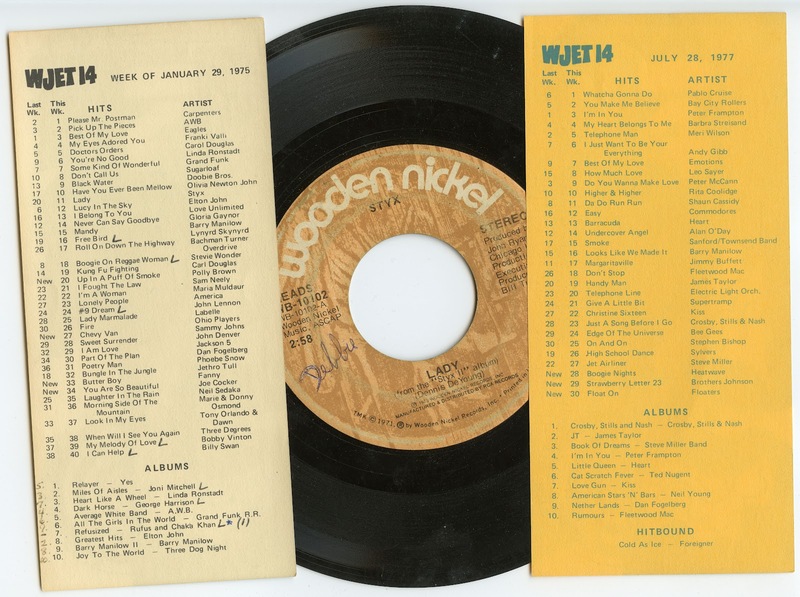 This Soul Q survey is a little ragged, but still a cool piece of Erie radio history. Soul Q aired seven days a week on WQLN-FM, and was produced at the OIC studio at 1503 German Street. Denise Williams' song "Free" was number one for the week of February 19, 1977. Soul Q ran until 1979, when Bobby "K" Kaigler joined Homer "Lee" Smith on Super Soul Saturday, broadcast each week on WERG-FM. Click here for a more complete history of Super Soul Saturday. When the guys were shooting hoops at McKinley Park or on the basketball court at 23rd and Ash, it was a given that the boom box was blasting the latest soul or R&B hits. Houses for sale as advertised in the Erie Dispatch-Herald, Dec. 31, 1921. 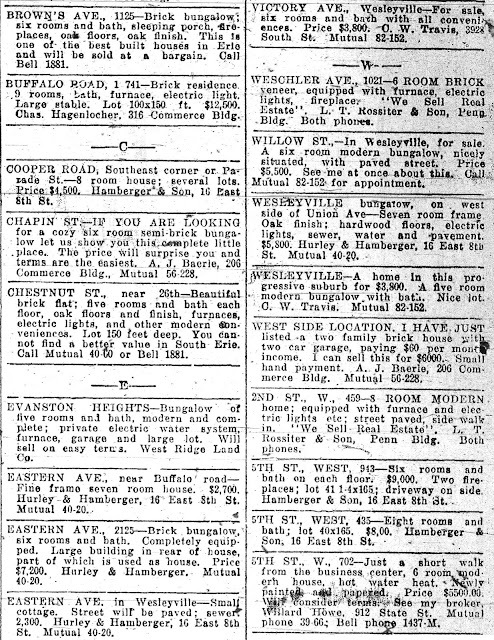 Check out these house prices from Dec. 31, 1921! It's fun to look at old newspapers on microfilm in the Heritage Room at the Blasco Memorial Library. You could buy a house on East 38th (then called Cooper Rd.) and Parade St. for $4,500 in December of 1921. Prefer to live on the west side? How about a house at 943 West 5th St. for $9,000 or 702 West 5th St. for $5,500. How about a brick bungalow at 2125 Eastern Avenue in Wesleyville for $7,200? This one featured a large building in the rear of the house, part of which could be used as a house. 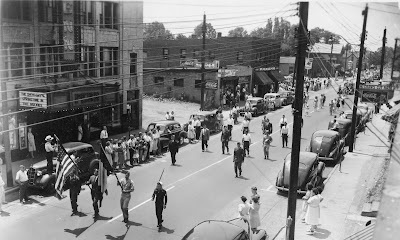 Penn Theater and parade on Buffalo Road in Wesleyville July 4, 1947. Photo courtesy of Nancy Schaffner Coake ©2012. The Penn Theatre in Wesleyville holds fond memories for people in Erie, Wesleyville and Lawrence Park. "The Show Off" and "Springtime in the Rockies" appeared on the marquee at the Penn when this photo was taken on July 4, 1947. I love to check out the cars in these old pictures. This was a time of celebration, when people considered it their patriotic duty to honor the war heroes. The parade celebrated the dedication of Memorial Field in Wesleyville and was led by returning veterans from each branch of the service. Businesses from left to right include: the Penn Theatre, 2917 Buffalo Rd. ; a vacant lot (later the site of Smith Furniture Co. and then Baby Fair at 2911 Buffalo Rd. ;, Wright's Ice Cream Bar, 2907 Buffalo Rd. ; William Wright Jeweler, 2905 Buffalo Rd. ; W. H. Kehr Grocery, 2901 Buffalo Rd. ; Eastern Avenue intersects; Mobil Gas Service Station on the southwest corner; Grenz Motors, 2809 Buffalo Rd. The Penn Theatre opened on Sept. 15, 1927. Crowds lined the sidewalk along Route 20 to see the movie, "McFadden's Flats." Admission prices in 1927 were: Children 10¢. Matinee 15¢ and Evenings 25¢. The Erie Playhouse held performances here after the old theater stopped showing movies. Nearly all the buildings visible here have been demolished. Country Fair currently occupies this property on the corner of Buffalo Road and Eastern Ave.
During the summer between tenth and eleventh grade, I wrote for the Erie Star Magazine, published by Randy Arrowsmith. I thought this would be a great stepping stone on my way to Rolling Stone. 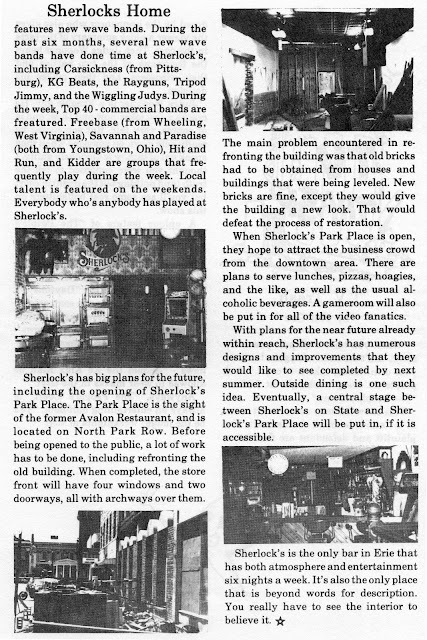 I wrote about Sherlock's on State Street and Park Place on North Park Row. The two bars connected and formed an "L" shaped property. 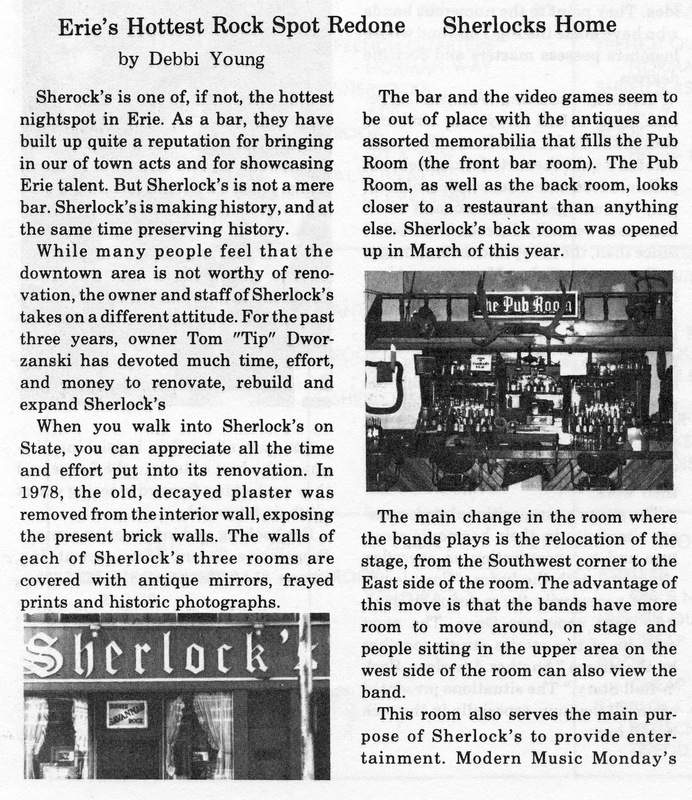 Given my young age, I was allowed but a brief time to gather information inside the bar, and the owners were none too happy about me being there. Think 'Drive by Writing.' You'll notice there are no quotes from anyone who worked at the bar. Sherlock's was located in the building that housed the old Parris Supper Club. The bar is still going strong in 2014. Bus drivers for EMTA or the Erie Coach Co. I have a handful of photos of men who drove bus for the Erie Metropolitan Transit Authority (EMTA) or its predecessor, the Erie Coach Company. A friend saved these items from being tossed into the trash. Most of the photos are labeled on the back, but these were not. EMTA took over the Erie Coach Company around January of 1967. The old Erie Coach Company's garage faced State Street between Second and Third Streets. 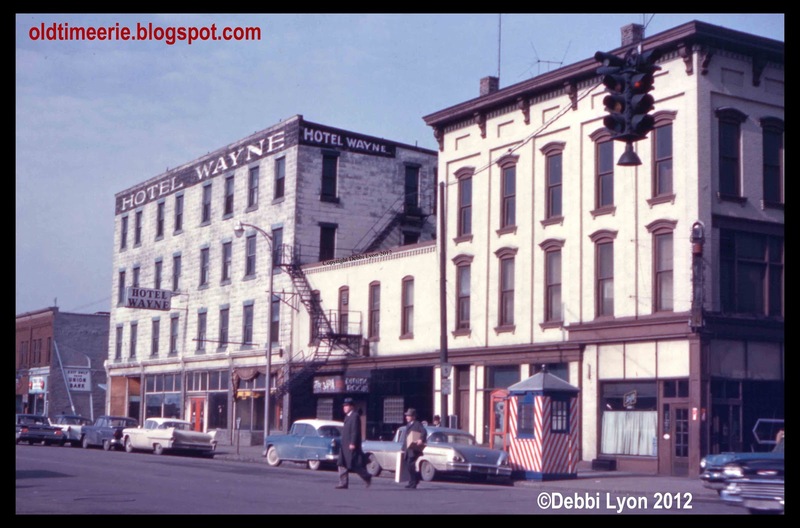 Hotel Wayne on West 12th near State St. Feb. 1961. Photo by Chester Wasielewski ©Debbi Lyon 2012. Another shot of long lost buildings in Downtown Erie. This one features Hotel Wayne on West 12th Street. The smaller building to the right of the hotel was the side entrance to The Spa. The brown building on the northwest corner of 12th & State was a bar. 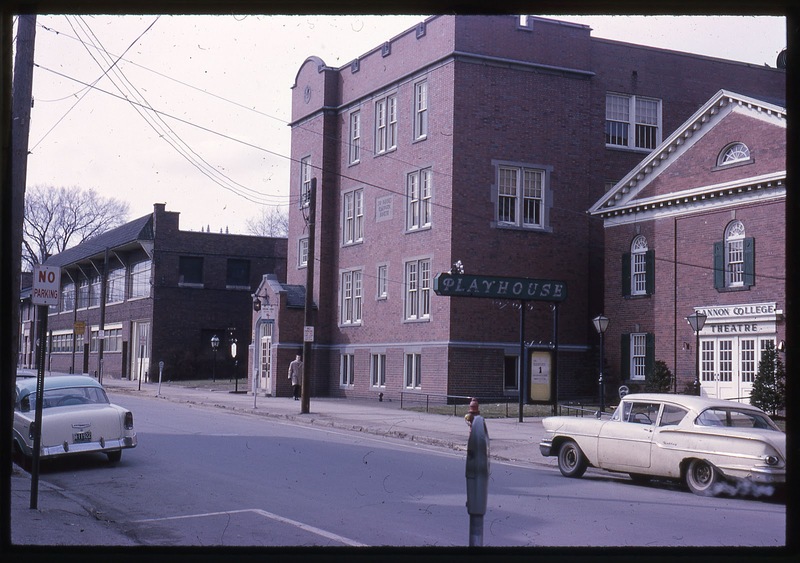 Notice the old Chevys parked along Twelfth Street? Probably long gone, along with the buildings and the parking meters. The little red and white shed might have been used for the traffic cop who directed traffic on 12th and State. There is a red telephone booth to the left of it. Citizen's Bank currently occupies the northwest corner of Twelfth and State. The rest of the property from State to Peach is a parking lot. Labels: Downtown Erie, Erie PA, Hotel Wayne, State St., The Spa, Union Bank, West 12th St.
1) Eleven miles of concrete roadway and a mile of gravel road provides easy access to all parts of the Park. 2) Fifteen miles of trails give extensive opportunity for nature study, hiking, and horse-back riding. 3) Six hundred picnic tables and one hundred picnic stoves provide facilities for picnicking. 4) On peak days, it is necessary to establish a time limit of 1 1/2 hours for use of a picnic table by any one party. 5) The Park is closed to visitors at 12 p.m. from June 15th to Sept. 15th, and at 11 p.m. from Sept. 15th to June 15th. Wasielewski, © Debbi Lyon 2012. 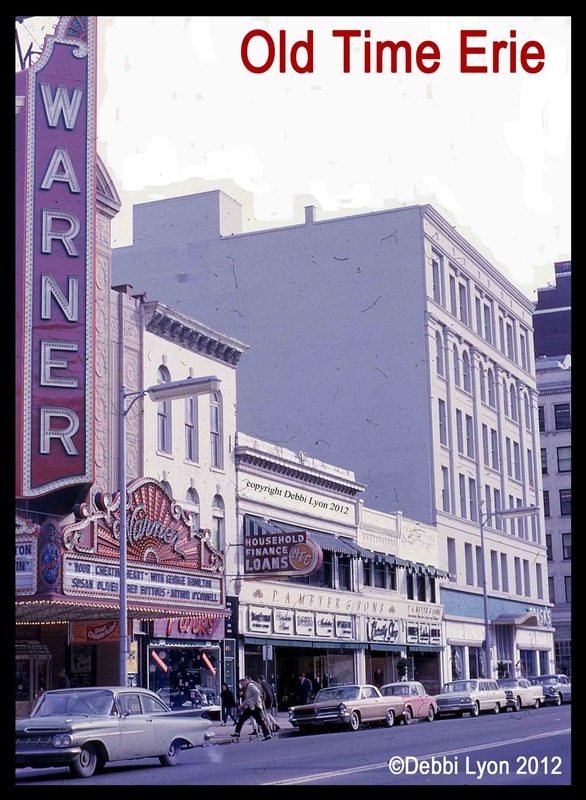 This shot of the Warner Theatre at 811 State Street in Erie was taken about 1965. The movie on the marquee is "Your Cheatin' Heart" starring George Hamilton as Hank Williams, Sr. 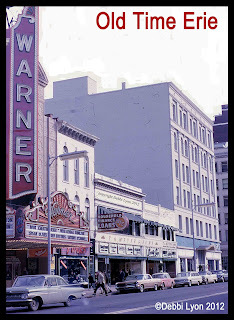 The Warner Theatre has been restored to its glory days and many special events are held here, including concerts, dance recitals, high school graduations and weddings. The Floral Gallery is next door at 815 State St. There are law offices at 821 State St. Mid City Towers occupies the corner where the old Trask's department store used to be. Mid City Towers, which has an address of 12 East 9th Street, has several businesses on its ground floor. P.A. Meyer was destroyed by fire and later demolished. Here are some Erie movie theater ads from 1948. Movie start Bob Hope really did get married in Erie, PA. He was born Leslie T. Hope in London, England and came to the U.S. when he was a child. Bob married Grace Troxell on January 25, 1933. He lived in Cleveland and listed his occupation as salesman. Grace lived in Chicago and was a secretary. Bob made his big-screen debut in 1938 with "The Big Broadcast of 1938. Bob was not the first celebrity (or soon to be celebrity) to get married in Erie County. Roscoe "Fatty" Arbuckle married Addie McPhail in Wesleyville, PA on June 21, 1932. Bob later married Dolores DeFina. There is some debate as to when and where they got married, and some media outlets claim that Bob and Dolores were married in Erie. Can you name these visitors to the Meadow Brook plant at 2365 Buffalo Rd. in Erie, PA? I'm writing a book about milk bottles and dairies of Erie County, PA. I came across a photo which was taken in front of the plant at 2365 Buffalo Road in Erie. Please leave a comment if you can identify anyone in the photo. The nuns might be Sisters of Mercy order. Thanks! Front row, left to right: unknown, unknown, unknown, John Griffiths (in white uniform), Kenneth Brown and Lloyd McGarvey. 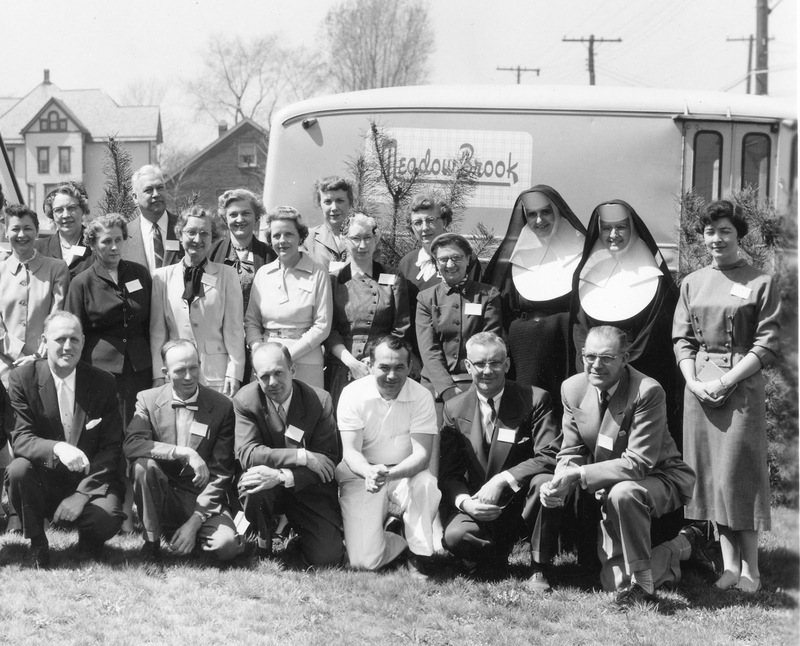 Middle row, left to right: nine unknown people, including two nuns. Top row, left to right: unknown woman, LeRoy McGarvey, Adeline May and two unknown women. Michele M: please send me an e-mail. I have a question for you. 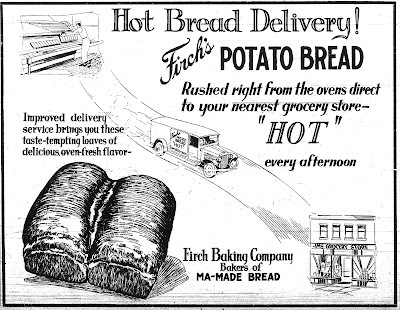 Firch Baking Company ad from Erie Daily Times Jan. 19, 1931. 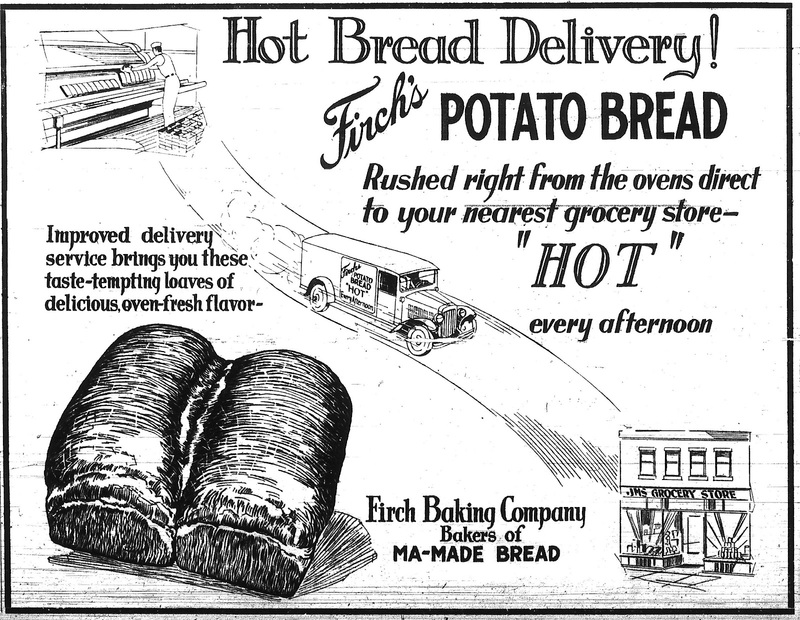 Firch Baking Company has a long history in Erie. This wholesale baking company had two locations in 1922, one at 1902 Cranberry and one at the corner of 4th and Walnut. At that time, George E. Firch was the secretary of the company. In 1976, Firch's was a subsidiary of the Kane-Miller Corp., and had a plant at 1220 West 20th Street, and a surplus store at 1250 Brown Avenue. Many of us used Ma-Made Bread to make a peanut butter and jelly or a bologna sandwich. The old, old Erie Sport Store at 709 State St., Erie, PA. Photo by Chester Wasielewski ©2012 Debbi Lyon. 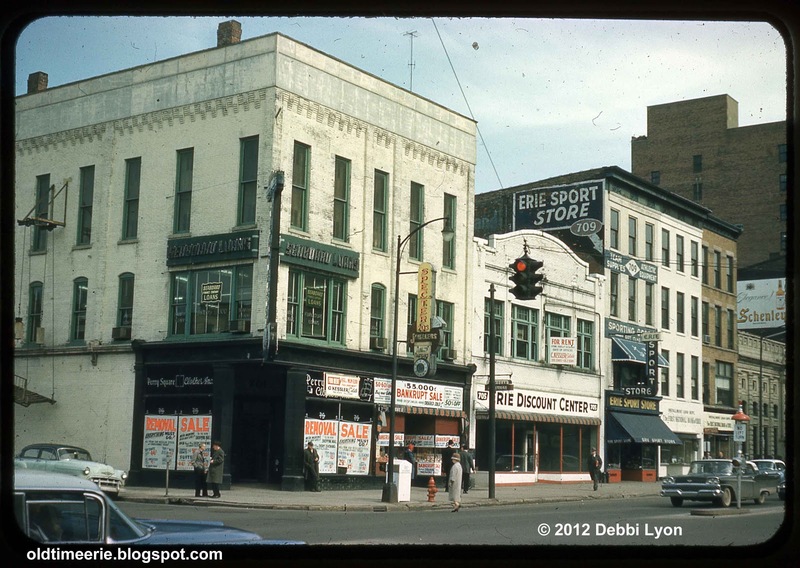 Here's a picture of the old, old Erie Sport Store at 709 State Street. The store on the corner, Perry Square Clothes, was having a going out of business sale. 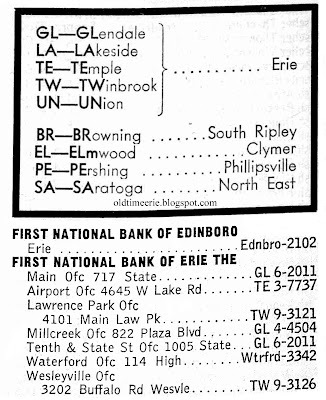 The other stores include Erie Discount Center at 705 State St., the Erie Sport Store (before the old/new one was built on the corner), the old First National Bank (before the facade was moved to East 26th St.). You can also see the old safety island in the middle of State Street; pedestrians could stand on this island if they got caught in between traffic lights. 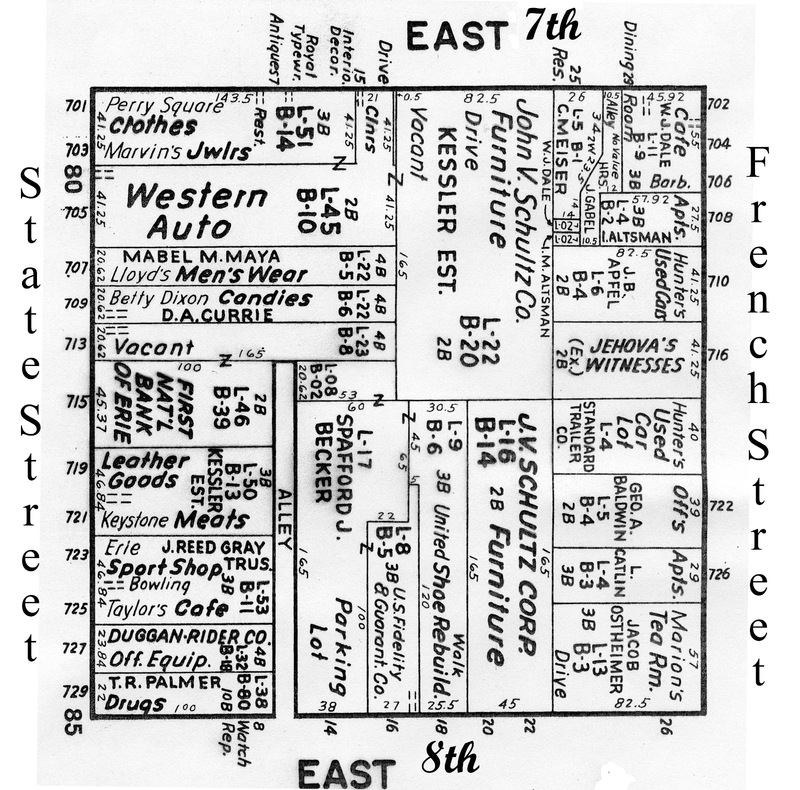 State Street map 1950 East 7th to East 8th St. 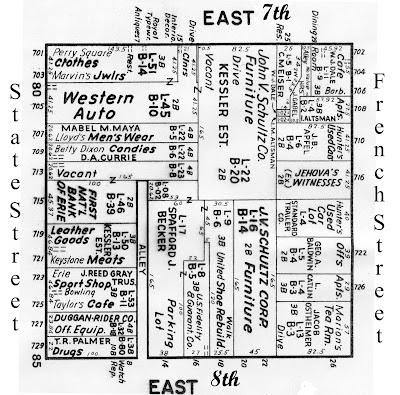 I found an old map that shows the Downtown Erie business locations in great detail. The old First National Bank Building was located at 715 State Street before it was moved to 138 East 26th Street. It's part of the Stairways' campus, and the bank faces Holland Street. All the other buildings on the odd side of the 700 block of State Street were demolished. Erie Sport Store constructed a new building at 701 State (which is now their old building), First National Bank currently has the middle building at 711 State Street, and Highmark Blue Cross Blue Shield has the building at 717 State Street. Thanksgiving 1956 Snowstorm on State Street in Erie, Pa. Photo courtesy of Sandra K. Sagala ©SKS 2012. The Thanksgiving Snowstorm of 1956 was one for the Erie, Pennsylvania record books. Twenty-seven inches of snow brought the city to a standstill. Cars were stranded all over Erie, PA. The National Guard was brought in. Helicopters airlifted food. WICU-TV on State Street. Yes, it was really THAT BIG! This photo shows the S.S. Kresge Co. on the left (on the west side) of State Street. Next is Eckerd Drugs, a chain that started in Erie on the northwest corner of Ninth and State. The Boston Store at 716 State Street is a familiar landmark, since the building still stands. Lots of Christmas decorations hang from the telephone poles. Did you spend the snow storm of 1956 glued to your radio? 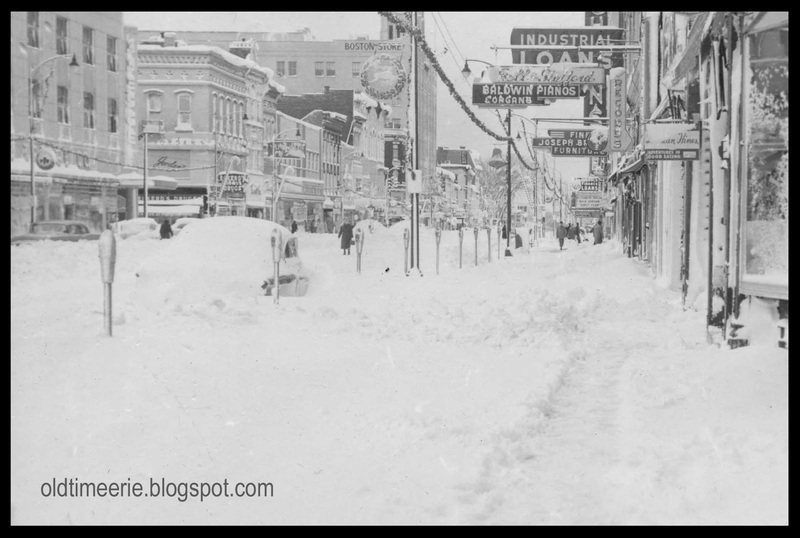 What do you remember about November 22, 1956 and the great Thanksgiving Blizzard? Click here to see a shot of Station Road (Route 430) in nearby Wesleyville, PA Thanksgiving 1956 snowstorm. The Shrug at Oliver's on French St. Photo by Debbi Lyon © 2012. The Shrugs released a CD "Once Around the World" around 1995. On the night I saw them at Oliver's the line-up included Eddie Sanford on guitar (shown on the left), Tony Krasinski on drums, William Cotter on guitar (on the right) and Ray Reilly on harmonica (writhing on the floor). I don't remember who the bassist was. This might be the show where I played drums on a couple of songs before the show started. Good news! You can listen to the songs by the Shrugs online! I forgot how much I like "Great Big Ocean." Check out music by this Erie, PA band and relive some memories. Enjoy fun facts about the history of Erie, PA here. 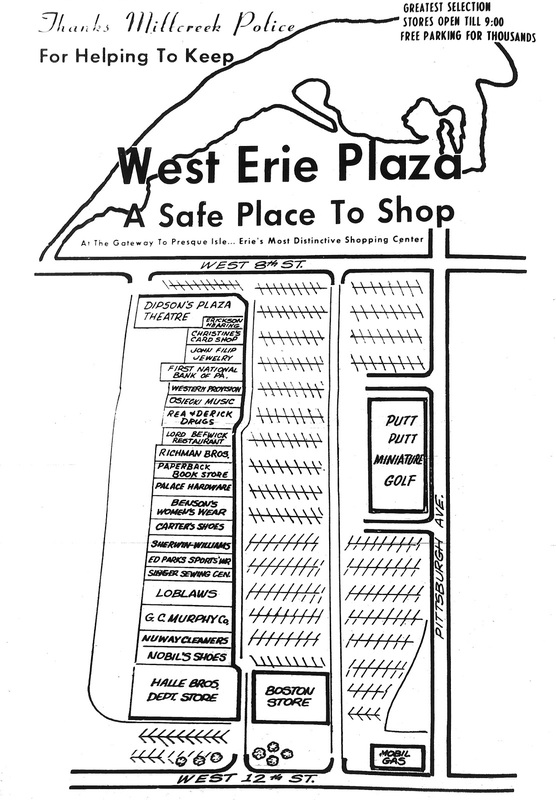 The West Erie Plaza was full to capacity when this map was published in the Erie Press on May 8, 1971. The Boston Store had a free-standing annex near West 12th St. Halle Bros. Dept. Store anchored the plaza on the West 12th St. end. Working northward, the stores included: Nobil's Shoes, Nuway Cleaners, G. C. Murphy Co., Loblaws, Singer Sewing Center, Ed Parks Sports, Sherwin Williams, Carter's Shoes, Benson's Women Wear, Palace Hardware, Paperback Book Store, Richman Bros., Lord Befwick Restaurant, Rea & Derick Drugs, Osiecki Music, Western Provision, First National Bank of PA, John Filip Jewelry, Christine's Card Shop, Erickson Hearing and Dipson's Plaza Theatre. Putt Putt Miniature Golf was on the Pittsburgh Avenue border of the West Erie Plaza. Mobil Gas was on the corner of 12th & Pittsburgh. 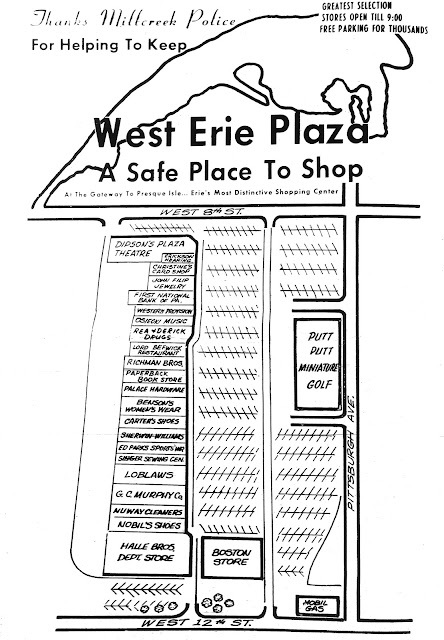 The Plaza was marketed as a "Safe Place to Shop" in this ad. Dipson's also had a theater in the Eastway Plaza: Eastway Plaza. 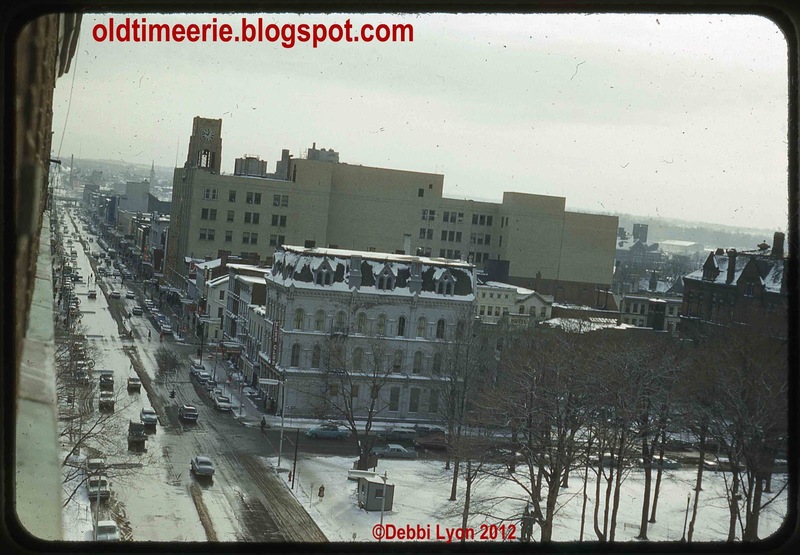 Tenth to Eleventh and State St., Erie, PA. Photo by Chester Wasielewski, ©Debbi Lyon 2012. State St. from 10th to 11th with Koehler Beer clock and Baldwin Bldg. Let's see how many businesses you recognize along the east side of State from 10th to 11th Street in Erie, Pennsylvania. We'll begin our tour with the old Koehler Beer clock on Tenth Street. The clock was perched atop a building just north of Tenth St. The Baldwin Bldg. anchors this shot on the left, with a sign for First National Bank. Next are a couple of buildings that have since been torn down, one of which housed Shooter's Tavern in the late eighties. Then the State Street Food Market. The Winter Co. is notable because it had a curved front window that was a perfect place to shove your friends into. There are still tiles in the sidewalk in front of this building bearing the Winter Company name. Babe Harkins had a City Council election office in the next space, and then the One Hour Cleaning and Sherman's Mens Wear. H&R Block and Seaway came next, along with a skinny shoe-shine shop. The Nut Kitchen was next, and the Hutch's Billiards Shop was on the corner. It's the place with the Pepsi signs. There is an EMTA bus on the left side of the photo. This was taken before the pedestrian safety islands were torn out. West Bayfront building, Erie, PA. Photo by Chester Wasielewski, ©Debbi Lyon 2012. Remember this building jutting out into the Bayfront on the westside in Erie, Pennsylvania? It's long gone, like so many relics from our past. The Bayfront Highway runs past the site where this building sat, and Erie Waterworks is visible in the distance behind this building. Please leave a comment if you know the history of this building. 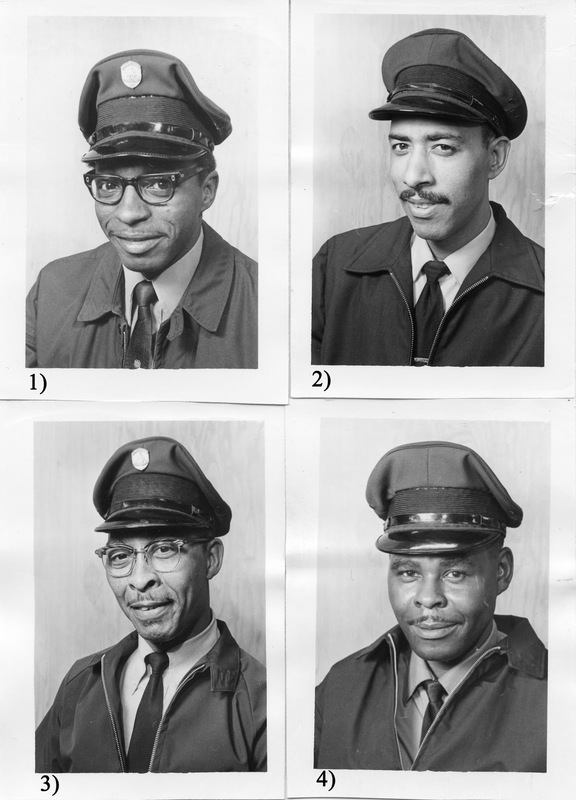 EMTA drivers Christmas 1967, Erie, PA. I would venture to say that most Erie, PA natives have hopped aboard an EMTA bus at some point in their lives. I used to catch Route 1 at the corner of 21st and State and ride to Wesleyville every Friday in the early eighties. Most times it was standing room only after school, when the bus was packed with kids heading home after transferring on State Street. 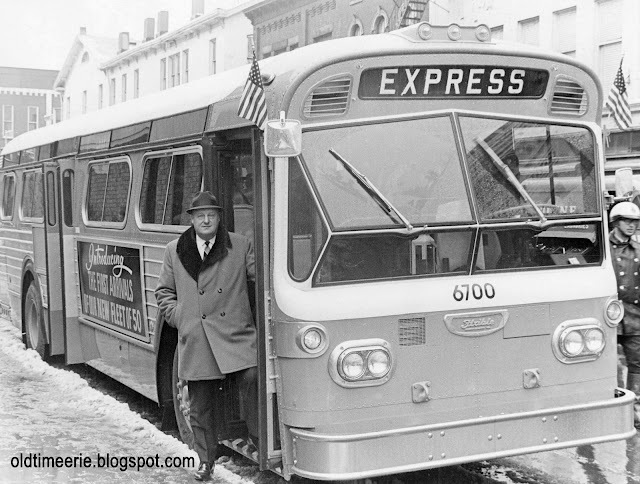 People used to ride the bus to shop downtown in the forties and fifties, lugging home bags full of clothing, shoes, hats and other sale items. On Saturdays, after bowling at the Perry Plaza, I'd save the .85 fare and walk to Record Country at 2905 Buffalo Road to buy a 45. Occasionally, I'd catch Route 1 at 21st and Ash, head west, then transfer to Route 9 to go to the Millcreek Mall. Those were the days when Route 1 traversed the city, and you could ride from the from Eastway Plaza to the West Erie Plaza on the same bus. 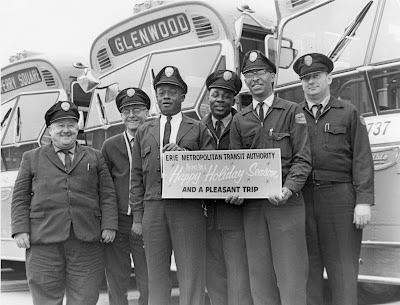 This photo shows a jovial bunch of transit workers holding a sing wishing riders a Happy Holiday Season and a Pleasant Trip. The EMTA drivers, from left to right, include Ernest Loscar, Andrew Franz, Samuel Hayes, Roy D. Polk, Harry Gambill and William Rounds. George N. Hathaway of Wesleyville, PA. The full name of the veteran. Veteran's address when he entered the service. 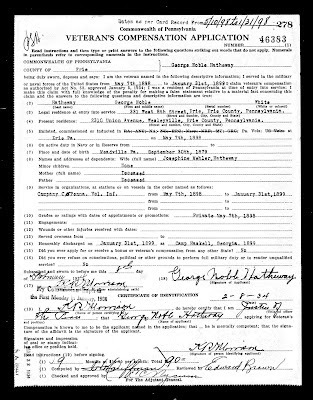 His date and place of birth. If married, his wife's first and maiden name. The names of his minor children. The names of his parents. Grade or rating and place of service. Date and place of honorable discharge. 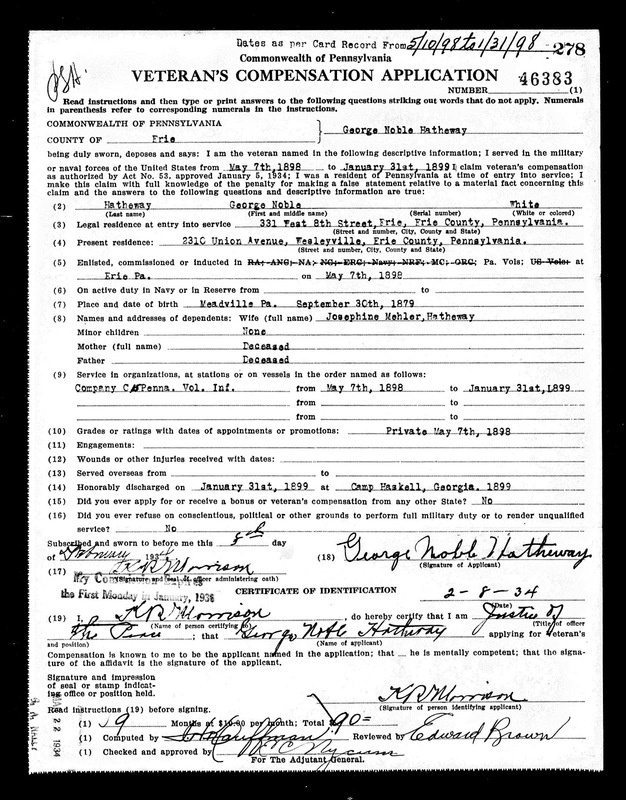 Veteran's address when application was filed. 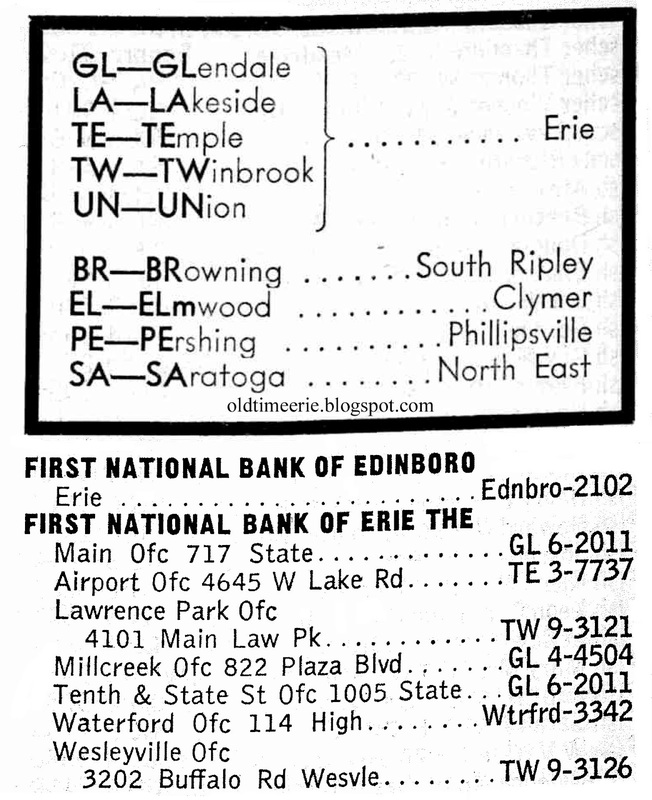 Grants ad from Erie Press June 24, 1972. 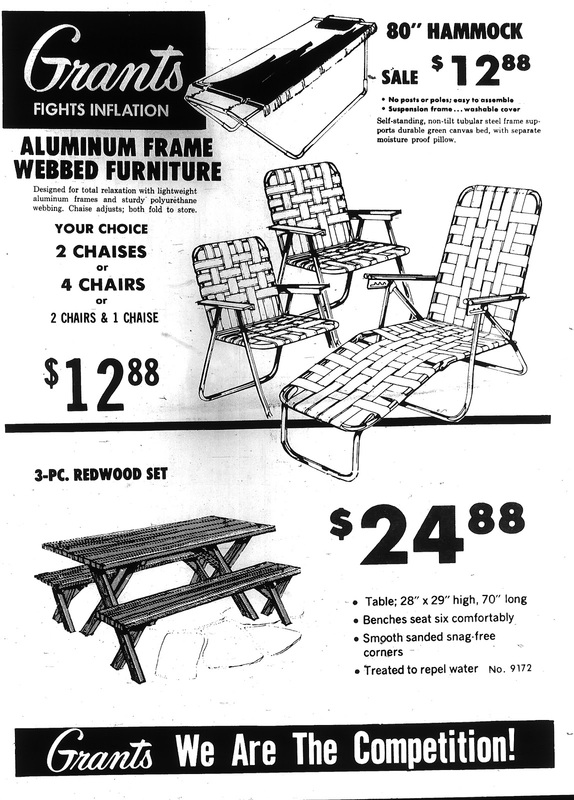 Nothing says summertime in Erie like a webbed aluminum chaise, a redwood picnic table, and an olive green hammock. And jarts. Everyone played jarts in the yard in the seventies, right? Grants was located in downtown Erie on Peach Street, with entrances on West 8th and West 9th Streets. The store was so big that people would use it as a path to cut through to get from one street to another, especially when it was raining or snowing. The chaise lounges and chairs had webbing that scratched your legs if your wore shorts. If you had a worn out or frayed piece of webbing, you could go to practically any hardware store and get a replacement. And you could chose several colors, such as white, blue, green or yellow. 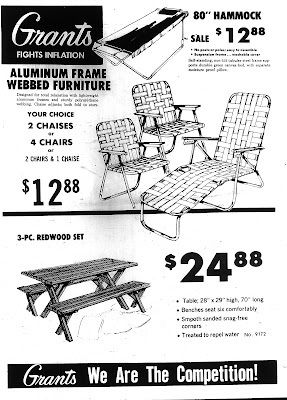 Oh, and the aluminum chairs were light enough to throw in the back of the station wagon, ready for any picnic or drive-in movie! Labels: Erie., Grants, Peach Street, West 8th St., West 9th St.
Gannon College Theatre photo by Chester Wasielewski copyright 2012. The old Gannon College Theatre, shown on the right, was across the street from the Zurn Science Center on West 7th Street in Erie. The old Pennsylvania Bureau of Employment was housed in the building on the left. The landscape looks much different today. 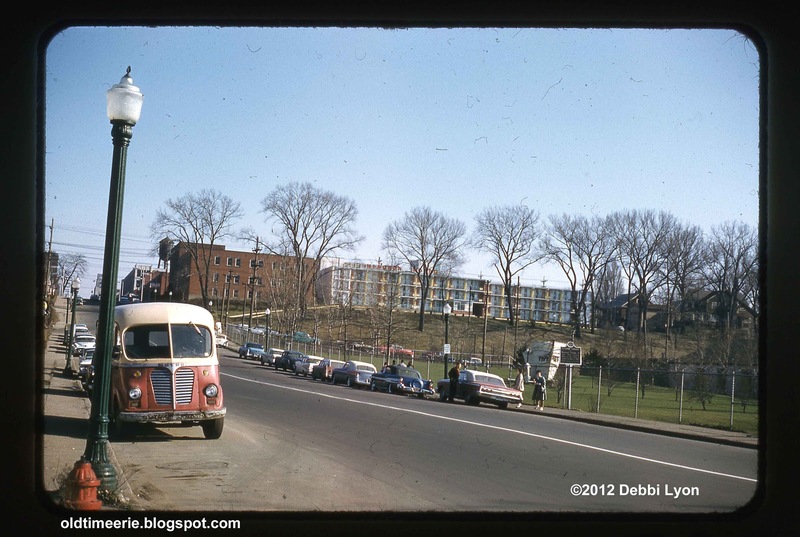 The buildings were eventually razed for green space and a parking lot for the campus of Gannon University. Labels: Erie, Gannon College Theatre, Playhouse, West 7th St.
Flyer for concert at Moon Meadows. 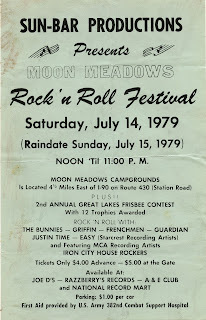 Summertime in Erie is the best time for music fans because there are concerts galore, including this one at the old Moon Meadows campground. These events were heavily advertised on the radio, and every record store had a stack of fliers on hand. Pittsburgh's Iron City Houserockers headlined the July 14th concert. "Love's So Tough" was a regional hit by ICH, featuring Joe Grushecky on lead vocals. 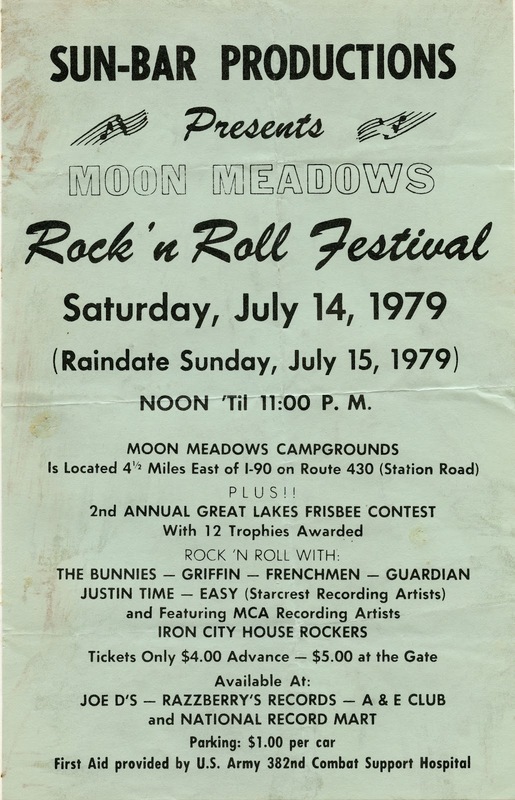 Six local bands rounded out the bill- the Bunnies, Griffin, the Frenchmen, Guardian, Justin Time and Easy. Three of the bands, the Frenchmen, Guardian and Easy, had or were about to release singles. Advance tickets were available at Razzberry's and NRM. Boston Store and the Elk's Club on State St. Photo by Chester Wasielewski, ©Debbi Lyon 2012. Ever wonder what the view was like from the upper floors of the Richford Arms Hotel? Well, now you know what it looked like before the new City Hall was built. The Elk's Club sat on the southwest corner of State Street, back when South Park Row traffic headed east instead of west. You can see the old City Hall on the right side of the photograph. The Boston Store is the big beige building in the center of the photo; it's clock tower is clearly visible. All the buildings between State and Peach, from South Park Row to West 7th Street, were demolished to make way for the new City Hall. The Elk's Club shown here was the old Erie Trust Company Building. Erie Public Dock and lower State Street. Photo by Chester Wasielewski, ©Debbi Lyon 2012. Bugging State on a Saturday night was what every hot blooded young man did back in the day, trolling for girls in Erie, PA. Here is a daytime shot of the Public Dock taken from Hamot Hospital. Nolan Boat works is in the upper left, the bow of the USS Michigan/Wolverine is on the left and the Brig Niagara is in her berth on the west side of State Street. It sure looks different now. 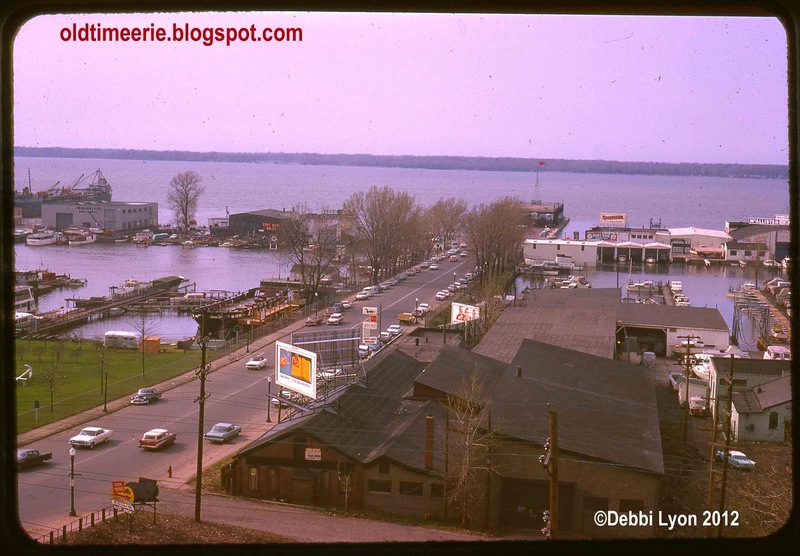 For instance, the large building in the center of this photo is now a field, the Niagara is parked behind the Maritime Museum, and the anchor from the USS Wolverine sits in front of the Maritime Museum on East Front Street. The Erie Steamboat Landing was the tall structure topped by a red flag at the foot of State St. It has been replaced with the Bicentennial Tower, a major tourist attraction in Erie, Pennsylvania. 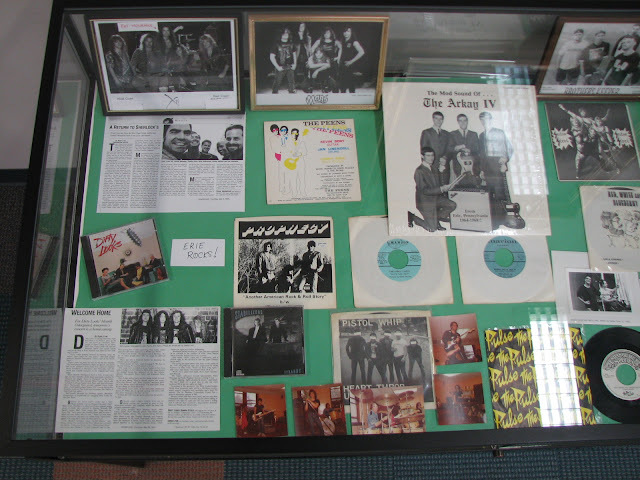 Old Display at the Blasco Memorial Library by Debbi Lyon. 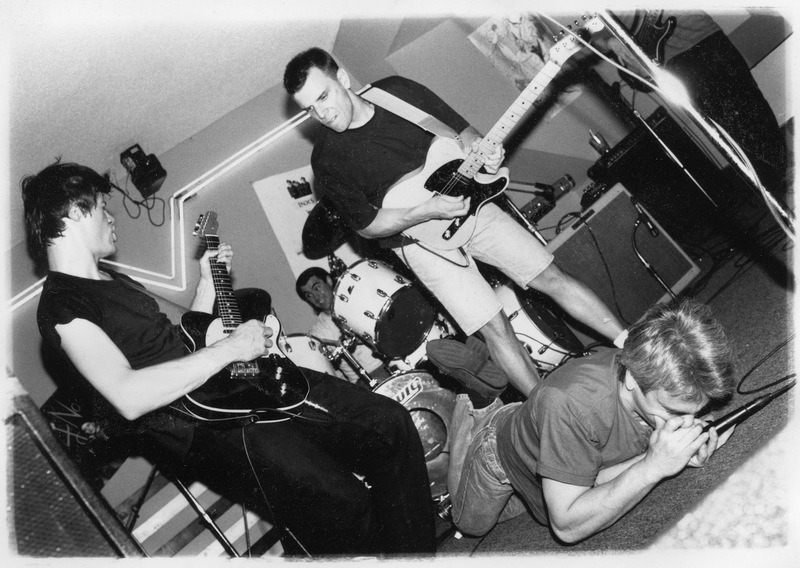 Several months back I gathered up a bunch of records, articles and pictures of Erie bands. The display was up for about a month at the Blasco Memorial Library and I thought I would share part of the collection here. So, here we have it...photos of X-It (featuring Pat Monahan, now of Train), Mars, Brother's Keeper, the Peens, the Arkay IV, Satin Steel, Dirty Looks, Prophecy, Red, White & Blueberry, Marty Lee with Donnie Iris, the Stabilizers, Pistol Whip and the Pulse. Johnny & Tune. Photo by Debbi Lyon. 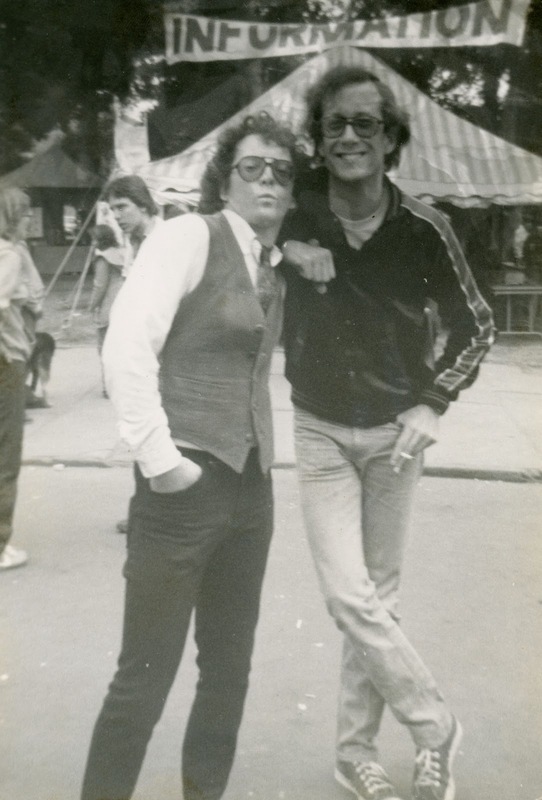 Johnny Pistol Whip, also known as John Drumm (left), hanging out in Perry Square with Jeff 'Tune' Klahr. I took this photo near the information booth at the Erie Summer Festival of the Arts. John was the snarly keyboardist and singer for Pistol Whip, the Frenchmen and Drumm/McDowell. Jeff played drums for a number of bands, including the Pulse, the Moonlighters, the Cattle Cruisers, etc. He also published an awesome zine called "Moods for Moderns." I just found a composition book used by my grandmother, Cecelia Rutkowski, while she was a student in the eighth grade at St. Stanislaus School on East 12th Street in Erie, PA. She was fourteen years old in 1928 and lived at 656 East 14th Street, just a couple of blocks from the school. 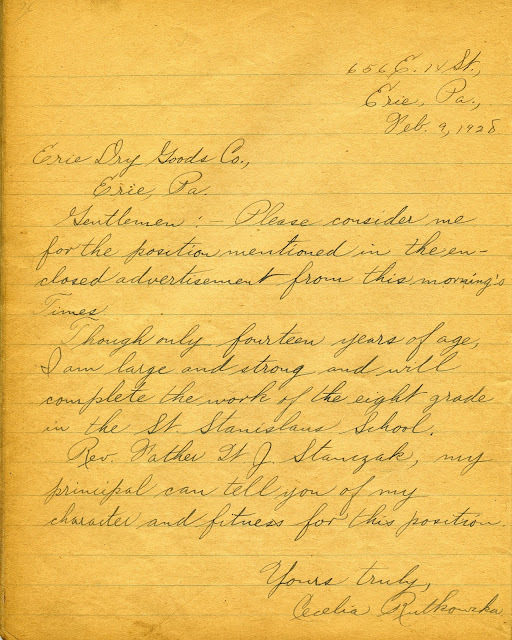 She wrote letters to the Erie Dry Goods Company, Lincoln Bank of Erie (on 12th and Parade), the Boston Store and the Erie County Electric Company. I'm not sure if she was able to get a job at any of the places she wrote to. It's possible that these letters were practice for English class. Gentlemen: Please consider me for the position mentioned in the enclosed advertisement from this Morning's Times. Though only fourteen years of age, I am large and strong and will complete the work of the eight grade in the St. Stanislaus School. Rev. Father W. J. Stanczak, my principal can tell you of my character and fitness for this position. Probably not so good. Time passes and people forget. Secrets are swept under the carpet until a family historian or genealogist digs them up. Over the years, I found a few interesting facts concerning murder and homicide in Erie. According to the Annual Reports of the Board of Health of the City of Erie, PA, two people died of homicide by firearms in 1918, and five people died of homicide by other means. According to the Annual Reports of the Board of Health of the City of Erie, PA, three people died of homicide by firearms in 1920; one person died of homicide by cutting or piercing instruments; two people died of homicide by other means; and one person died of fractures (cause not specified). 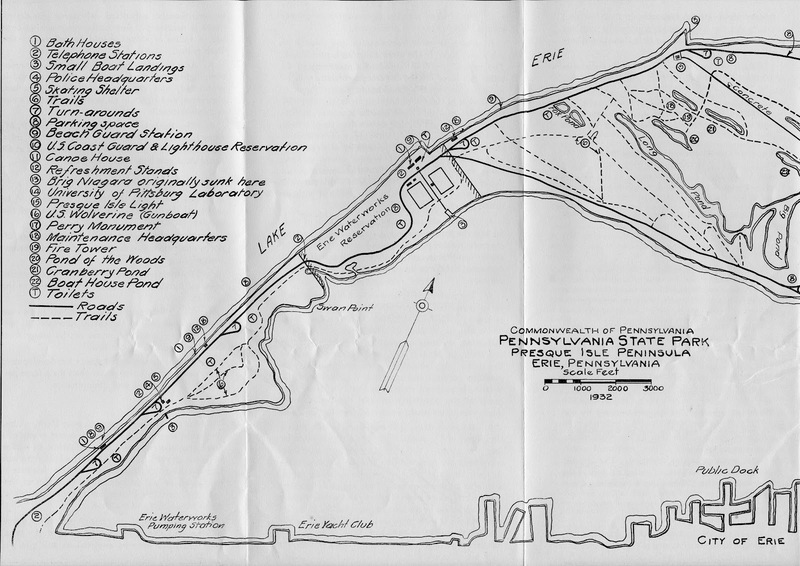 According to the Annual Reports of the Board of Health of the City of Erie, PA, one person died of homicide by firearms in 1921; one person died of homicide by cutting or piercing instruments; three people died of homicide by other means; and one person died of fracture (cause not specified). The Erie Blades played the Beauce (Quebec) Les Jaros at the Erie County Fieldhouse on March 10, 1976. The Blades competed in Western Division of the North American Hockey League, along with the Broome Dusters, the Buffalo Norsemen, the Johnstown Jets and the Philadelphia Firebirds. One thing was for sure- if you saw the Blades, you could count on a fight on the ice, and the crowd would go wild. 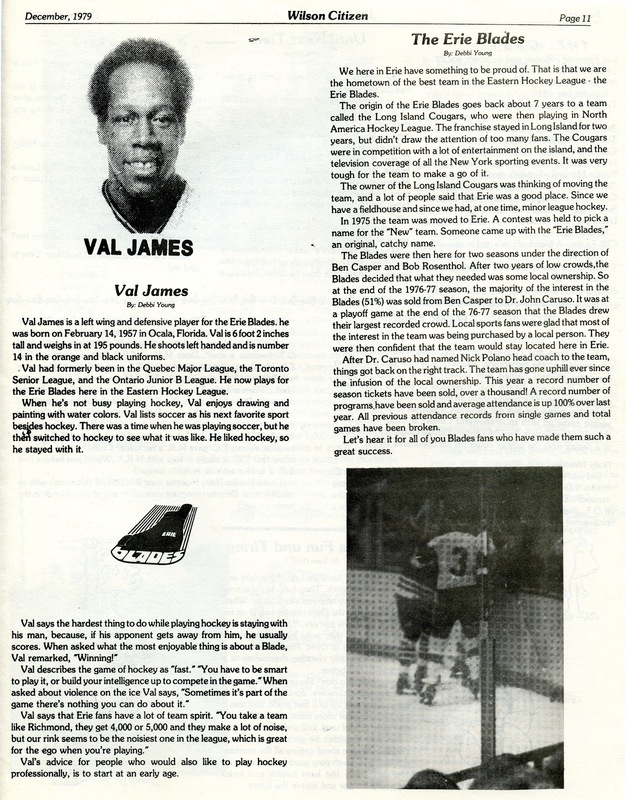 I followed the Blades for about three years, interviewing Val James for the Wilson Citizen, my middle school newspaper. The story, which ran in the December 1979 issue, was the first sports article that I wrote. I mainly wrote about music. 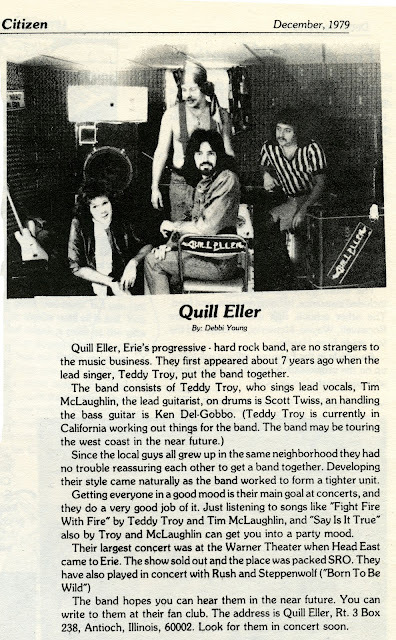 The issue also includes articles that I wrote about the eleven people that died at a Who concert in Cincinnati, OH on Dec. 4, 1979, and article about Quill Eller. Quill Eller featured guitarist Timothy McLaughlin (Strong Vincent Class of '71). State Street looking southwest. Photo by Chester Wasielewski, © 2012 Debbi Lyon. 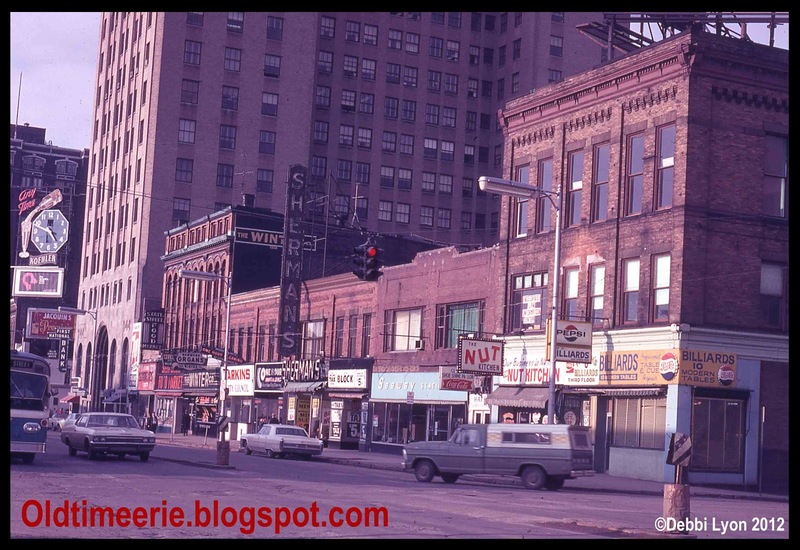 Downtown Erie, Pennsylvania looks a lot different than it did when this photo was taken on Lower State Street around 1963. The bow of the old USS Michigan/Wolverine used to sit in the park on the west side of State Street before it was moved inside of the Maritime Museum. The old anchor that was in the park now sits on East Front Street in front of the Maritime Museum. The big brick building on the top of the bluff on the left was the Hamot Hospital Nurses Home at 2 West 2nd Street in Erie. The Niagara Hotel is the long building next to it with the blue and yellow color scheme at 20 West 2nd Street. The Niagara was managed by Christ Scott, a Greek immigrant. His son Nicholas C. Scott, the President and CEO of Scott Enterprises, which owns hotels, restaurants, Splash Lagoon and Peakn'Peek. The Brig Niagara, which used to sit on the west side of State Street, is not visible in this picture. Back in the day, many teenagers and young adults spent every Friday and Saturday night Buggin' State.